I have two phones. Both are in working order. They are on loan to a local museum. One is in a leather bag and is model EE-8-A. The other is in a canvas bag and is EE-8-B. Both have handsets with the butterfly push-to-talk lever. The -A model handset may not have the original handset cord even though it looks to be an old cord. The -B model does have an original handset and cord. These have been tested in both LB and CB modes and work fine. 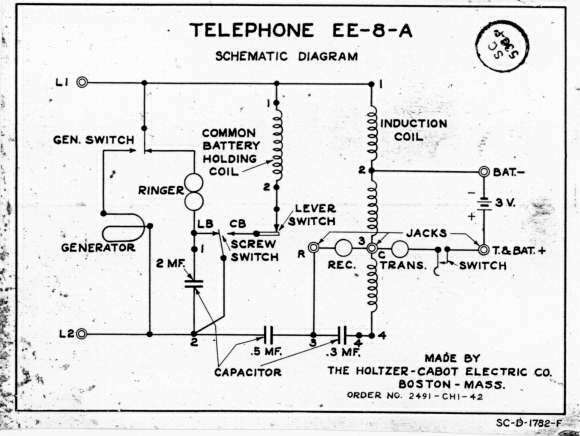 The EE-8-A handset TS-9-F has a receiver made by American Microphone Company Ltd. Sep 1943 type 113. The transmitter is type 1118. Regarding differences in the models EE-8, EE-8A and EE8-B, the first two are on an aluminum chassis and the B model is steel. There are three variations in the magneto (GN-38) but all appear to be interchangeable. The capacitors used in the different versions are approximately the same electrical values but some are multi-section capacitors in one case and earlier ones use discrete capacitors. These differences in the magneto and capacitors can readily be seen in these two images from the manual of the EE-8 and the EE-8-B. There is a smaller terminal located next to the two used to connect the phone line. It is the battery negative terminal and can be used with an external 3 volt battery, such as a pair of No. 6 dry cells instead of the internal two D cells. The battery positive is the handset terminal located farthest from the line terminals, labeled T&BAT+. The recommended distance between phones depends entirely on what type of wire is used. The maximum for a point-to-point circuit on type 104 open copper wire is 360 miles. The biggest thing that can go wrong is corrosion. Next would be the handset cord. That can be easily fixed if you're not trying to make it appear original. The rest of the insides is pretty tough. I'd be real surprised if you can't get them to work. One little feature which some people don't know is when you turn the crank only the OTHER phone rings. Yours doesn't ring. The handset has a butterfly switch which you must press in order to talk. While you have this switch operated the battery is being used. Otherwise, the batteries have no drain. It will not talk without batteries, but it will crank, ring and listen. There is one more switch. It is labeled CB or LB. This switch changes the mode from Common Battery to Local Battery. In CB mode, the hanger for the handset is in the circuit. You could connect the phone as an extension to your household telephone line and answer calls. It will ring and talk (provided the batteries are in it - yes in CB mode the batteries are still required to talk). In LB mode, the handset hangup switch is disabled for normal magneto phone operation. 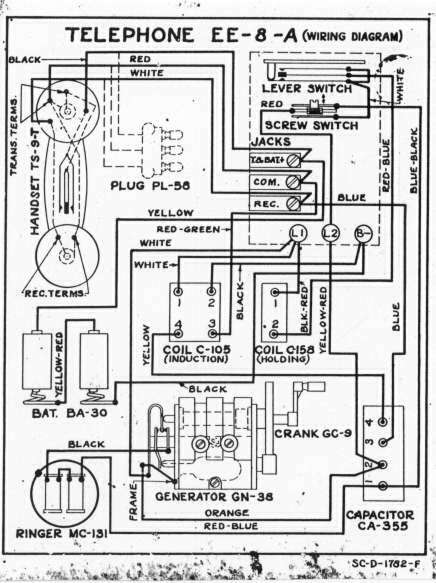 The schematic is available below and is a photo of the one inside one of my units. It may help illustrate how the CB-LB switch works. One caveat, if you hook it up as an answer-only extension to your home phone, it is very easy to NOT hang up the handset properly making your line appear busy to callers. Remember to oil the things that turn in the magneto. It will help a whole lot. e-Bay is a good place to search for phones for sale. Just enter "field phone" or "field telephone" into the title search.